Terkel was a remarkable person, a "Renaissance man" not only owing to the breadth of his activities, but also because of his boundless curiosity. 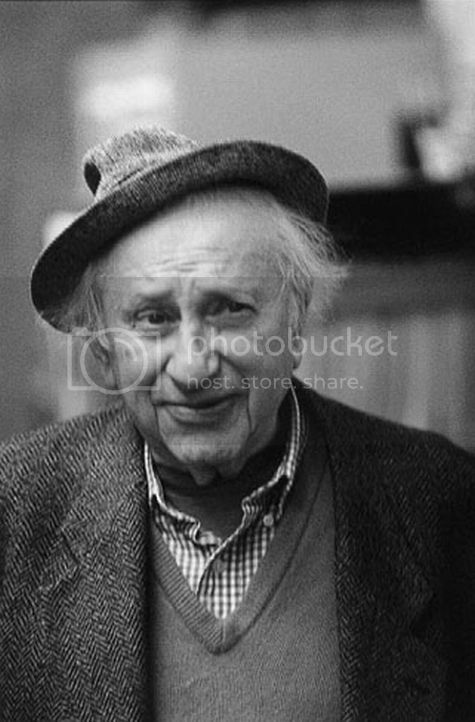 He happened too, to be a great actor, playing one fabulous Studs Terkel. Just last week, my son and I caught some of Eight Men Out, the movie about the 1919 Black Sox scandal. In it, Terkel played Hugh Fullerton, the sports writer who played a prime role in exposing the efforts of eight members of the Chicago White Sox to throw the 1919 World Series to the Cincinnati Reds. Terkel was wonderful in the part. At one point, I turned to my son and said, "He is perfect in this movie." The reason is simple: Terkel's Fullerton was Terkel's Terkel, a persona which was, at the same time, street-wise and idealistic, profound yet simple. No doubt being a Chicagoan born, raised, and living in a certain era contributed to who Terkel became. A certain cynicism was probably inevitable in any Chicagoan surrounded by the common corruptions of machine politics. Yet, like grass growing through cement, Terkel also seemed, in spite of his protestations to the contrary, to continue to harbor hope that human beings can do better. As a Christian, I believe that human beings can do better, but only if God is in their lives. Otherwise, that old sinner in us will get in the way. This is why reform must be a constant in human life; whether the reform is of things inside ourselves or of practices in society at large. That's because the human capacity for despoiling and ruining good things is infinite. I don't have much faith in the human race left to their own devices. But I have infinite faith in what God can and will do in human beings turned to God. What Terkel would make of that last paragraph, I think that I can guess. But I can't be sure. He was always full of surprises. Effective support strategies must be in place to provide all students with an opportunity for academic success, regardless of their personal situation, and to once and for all eliminate the achievement gap. If that means what I think it means, the governor is intent on taking on the corrupt shell-game that passes for educational funding in this state. Under the Ohio plan, in spite of the intentions of voters when they pass levies, the state effectively steals money designated for the local schools and put it all into state coffers. Several times, the Ohio Supreme Court has ruled Ohio's funding formula unconstitutional by the standards of the State Constitution. Yet, decades' worth of governors and General Assemblies, members of both political parties, have failed to reform the system. Until such reform happens, no other changes in public education will make a difference for Ohio. If you're on Facebook, go here. Charlie Lehardy is celebrating. Go read his blog...often! So what? It's seen as an indication that the nation, the economy of which is in something of a freefall, has negotiated a deal with the International Monetary Fund (IMF), often accused of making steep demands on client nations. If the move and IMF loan can arrest Iceland's decline, that's good. My apprehension has been that Iceland would go through with loans for which it was negotiating with Russia. The last thing we want to see happen right now is for nations to become beholden to either Russia or China. The governments of both of those countries can be expected to attempt leveraging loan agreements for strategic advantage, destructive of the interests of both the international community and of their own peoples. From Kiplinger's. I thought that this was clever. Back in the Stone Ages, when I did my student teaching at Bishop Ready High School in Columbus, my supervising teacher was a terrific guy named Joe Palazzo. One day, after Joe observed me teach twelfth-grade Government class, he gave me two pieces of advice. First, he said: Get off of your mountain. Come down here with the kids. That’s where you can teach and they can learn. But he also gave a second and more important piece of advice. “All effective teaching, Mark, boils down to two principles: Repetition and concreteness. Repeat it in as many different ways and as many times as you can. And then, make it real. Help them to see it." The greatest teacher who ever lived was Jesus of Nazareth. He was often called rabbi, teacher, even by those who opposed Him and thought that His claims to be God and Savior of the world were out to lunch. In our Gospel lesson for today, we find Jesus exemplifying Joe Palazzo’s principles of teaching in order to get across the most important message you and I will ever receive. Jesus tells us that He is the best friend we can have and that to be truly free, we need a connection to Him. He breaks this lesson down into three parts. You and I might chafe under those words a bit. Jesus’ fellow Jews, people who had believed in Him, certainly reacted to His words. They told Jesus, in spite of a history of enslavement, that they had never been slaves to anybody. This claim demonstrates that denial is more than a river in Egypt. The last thing any of us wants to admit is that we aren’t free agents, doing exactly what we want to do in life. The daughter of friends of ours, when she was two years old, would grow indignant with anyone who tried to get in her way. “Mine a do it!” she would insist loudly. In telling us, “Stick with me and you’ll be free,” Jesus implicitly tells us what He makes explicit in Part Two: “Everyone who commits sin is a slave to sin." That rings true to me. The first time I remember a swear word passing through my lips, I was in the sixth grade. It was the day of the Halloween party and I was frustrated. Everyone had come to school in the costume they were going to wear on what we called Beggars’ Night in Columbus. I was dressed as a girl, complete with dress and make-up. I guess my mom and I were the only ones who didn't get the memo that said all students should bring a change of clothes. So, there I was at recess, playing Four Square with my classmates on the playground, the only one still in my Halloween costume. In drag! Here’s what I found. After I’d sworn once, misusing the gift of language and violating God’s will for human beings, it was a lot easier to do it a second time. Easier still to do it a third. Sin creates holes in our souls and unless we’re careful, sin will flood our lives, making us its slaves, sinking us into the muck of evil, far from God. “When I first started raking money from the company, I was conscience-struck,” one man admitted. “But after awhile, it became easier. I had all sorts of justifications for it.” It’s easy to become the slave of sin. In fact, the Bible tells us that we have an inborn inclination to sin. That’s why Jesus’ promise, “Stick with me and you’ll be free,” is really good news! So, how do we get free? Well, we don’t. Only God can free us. That leads to Part Three of Jesus’ lesson: The Son has the run of God’s kingdom. That's why when you stick with the Son, He will set you free! I once got to know a local judge who seemed to take both his faith and his work seriously. Another man I knew was charged with a crime and brought before that judge. The man was clearly guilty. But I knew how remorseful he was and I intervened, asking the judge to go easy on him, not imposing prison time. But after finding us guilty and pronouncing our death sentence over us, Jesus does something extraordinary. He takes our punishment. That’s what He did when He voluntarily went to the cross, though He had no sin. He took the punishment that you and I deserve. All who remain with Jesus, everyone who sticks with Him, is set free from sin and death and have a life with God that never ends. On a cross, Jesus made God’s love so concrete you can’t doubt how real it is. And from an empty tomb, He made clear His power and His desire to give us life that lasts forever. These are the greatest object lessons in human history! On October 31, 1517, All Saints Eve or Hallowed Eve—we call it Halloween, Martin Luther posted ninety-five theses for debate on the church door where he served as priest in Wittenberg, Germany. It began a movement within Christianity that continues to this day, a movement that reminds the world that salvation and new life aren’t things we earn or buy or steal; God sets us free to be our true selves—the selves God made us to be—through Jesus Christ and Jesus Christ alone! The Bible teaches and Luther’s Small Catechism underscore that there are three things that enslave us, causing us to place our confidence in dead things like money, possessions, and religion. Those three things are the devil, the world, and our sinful selves. Jesus Christ can set us free from them. She had a difficult childhood, sexually abused by her own father. In adulthood, she made success and pleasure her gods, anesthetizing herself with constant work, the mad chase for dollars, spending sprees that maxed out her credit cards, alcohol, marijuana, and other drugs. But nothing set her free from her sense of inadequacy, from the shame she felt for her victimization, from her guilt for the choices she made for selfishness and self-will. A friend invited her to a small group Bible study. There, she heard Jesus’ parable of the prodigal son, a story that assures us that no matter how far we may stray from God, through Jesus Christ, God wants to welcome us home. God wants to set us free from all that enslaves us, kills us, or fills us with a sense of futility and meaninglessness. God wants to set us free to live abundant, eternal life with Him. “I’ve heard that story a million times,” she said. “I never realized that it was anything more than a story. I never knew it meant that God cares about me.” For the first time in her life, that woman began to sense the freedom to live that Christ wants us all to experience.